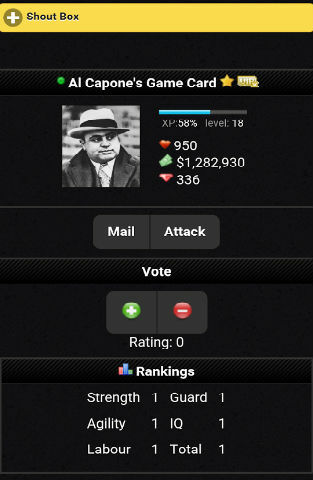 Mob Hustle – Mafia RPG for Android, available from the Google Play store, is a massively multiplayer game that sets you on the path to becoming mafia boss, with some interesting elements that really help it stand out from the crowd. Mob Hustle is special in the way that it gives you so many different activities to do. Many games of this type give you two or three ways to make money and level up, but here there are so many different things to do, it makes the grind a surprisingly enjoyable one. 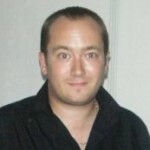 Most of your time will be spent in the pursuit of cash and crystals, which are the game’s currencies. You can obtain these by doing one of the many different activities in the game, from simply walking the streets and partaking in a spot of looting, to managing your suspiciously obtained real estate empire, and even taking on other players in PVP battles. With this type of game, an important element is just how much the game will allow you to earn in-game, as well as what it gives your for free each day, in relation to what you can purchase with real money. Here, I feel the developer has got the balance spot on as yes, you can buy things to give your game a shot in the arm, but players could very easily play this without ever having to spend a penny, which is how it should be. Interacting with other players is core here, and the game provides several avenues to do this, from chat options to full PVP gang warfare. It works well, and although more players would be nice, I am hopeful that a community will start to grow around the game. The game uses a menu based interface for most of the action, and it works well enough, as everything is intelligently placed and presented and you never get lost, despite the multitude of options, features and activities on offer. 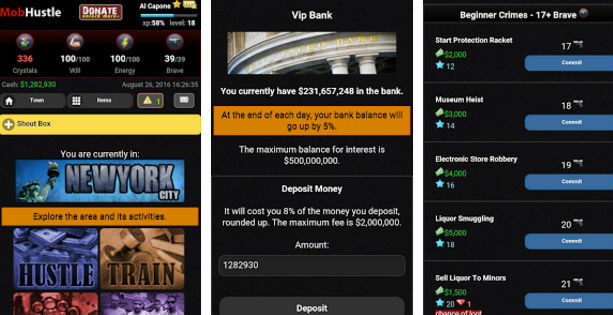 Overall, with a well designed interface, plenty of activities and a fully featured social suite, Mob Hustle is more than worthy of a download, check it out.